Miva Review: "One of the best ecommerce shopping carts available"
I use Miva Merchant as an ecommerce solution for my clients. Miva Merchant is easily capable of handling everything from smaller stores/individual sales to large and enterprise level businesses. The design is fully customizable in Miva, so I can implement my own or others' custom designs into a store and also adjust the code for SEO, google snippets, etc. Miva is extremely secure and passes all PCI/PDA-SS requirements which is extremely important. Miva is fully compatible with a number of popular third-party services like PayPal, Power Reviews, Shipworks, Authorize.net, etc and can be easily integrated with others. Expandable Functionality: Store functionality (gift certificates, coupons, shipping,etc) can be customized via code on the page templates, or third-party services/modules can be integrated to add features. Even better is that more and more of the third-party features are being built into the core features with new releases! Design: The store design can be fully customized to accommodate almost any design elements. Access to the page template code allows you to make customizations such as adding third-party code snippets (order tracking, live chat software, etc), adding if/then logic statements for dynamic customization, or to add a full custom design to the entire store. Security: PCI/PDA-SS compliant - There are not a lot of carts out there that are fully PCI compliant, and this is especially critical now (credit card companies are really beginning to crack down on this). The Miva admin area hasn't been the most user-friendly in the past. However, the admin in the the upcoming new Miva Merchant 9 Release has been completely revamped, is VERY user-friendly, and is formatted for desktop as well as mobile devices. Some fairly standard ecommerce functionality like Gift Certificates, Coupons, Sale Prices, etc have previously required third-party modules or template customization. However, many of these features are being built into Miva Merchant upcoming releases. orders? Do you offer affiliate accounts? How custom of a design are you looking for? Miva is very well suited for small business to enterprise level business sites or for stores that require lots of customization. Miva Merchant ecommerce design and development is at the core of our organization. We try to solve any ecommerce pain points our clients may experience. The Miva Merchant platform is extremely flexible and open to customization without the ability of the end-user breaking pertinent functionality. Streamlined software updates without breaking existing design/functionality. User Review: "MIVA Merchant. Almost Perfect." We use MIVA Merchant as our platform of choice for developing both online catalog and eCommerce project for clients. While we might consider WordPress for clients with a very small inventory, MIVA is the only other platform we use. The ongoing development of the platform, responsive MIVA support and the active community of developers make this a very good choice for us. Ongoing development. MIVA has, over the years, added features and functions to the platform that keeps it both secure and feature-rich. With recent releases, for instance, MIVA is PCI compliant and many of the most used 3rd party modules have been incorporated. MIVA Support. Support is responsive and can be very technical. Active forum of developers. This is a great resource for those times when a client has asked for a function I've not seen used in MIVA. Developers on the MIVA forums often have suggestions or solutions to share. The internal search function is somewhat basic. Ideally the a search would potentially use multiple data fields. Selling digital items for download isn't yet an option. MIVA isn't responsive so that it reduces nicely on mobile devices. Few scenarios would cause me to steer a client toward another platform for a catalog or eCommerce project. Other than the monthly hosting cost (generally around $50 per month for MIVA), comparable platforms offer no great benefit over MIVA. I do have clients that have opted to have small eCommerce projects developed in WordPress, which does often have a lower cost and shorter production time. I would also offer the WordPress option to clients selling soft goods or needing a responsive site as these aren't MIVA features yet. Review: "Miva Merchant, a solid and affordable platform for e-commerce"
We are an independent Miva Merchant support organization that helps clients leverage the power of the Miva Merchant e-commerce platform. Our own Web site uses the Miva Merchant system as it's shopping cart system so we are drinking our own kool-aide as well. Ten years in this community we have seen Miva Corporation and the Merchant product and selection of features and service grow substantially. Most of our clients are looking for full featured e-commerce systems that are more open than something like IBM WebSphere Commerce Server and at a greatly redued cost. Miva Corporation's Merchant application fits our clients functional requirements at a very affordable price point. The ability to quickly change the look and feel of any given page in the store. The storefront, category, product description, and all checkout pages are easily customize-able using simple HTML language. With minimal effort, more sophisticated changes and behaviors of the store can be modified using MivaScript, the language Miva Merchant is built upon. New features are very easy to add using a huge selection of 3rd party feature modules that typically sell for less that $100. Miva has so many features already built in, but if there is a major common feature not already in the code, it's almost a sure bet that there is a affordable and easy to install module that will meet your e-commerce business requirements. Miva corporation provides a high level of free support 7 days a week and 24 hours a day. Robust shipping functionality for UPS, USPS, and Federal Express should be included in the system if possible. Softgood/secured content delivery would be a welcome added feature. If you need an e-commerce system that is flexible and full featured at a reasonable price point I would say Miva Merchant is very hard to beat. Review: "Miva Merchant - in it for the long haul"
As we are a Miva Merchant Partner, we provide workflow and add-on tools for the Miva Merchant platform. In addition, we run our fulfillment, licensing, and CRM systems on Miva Merchant as well. We are able to keep all our systems 'in-house' without excessive use of third-party SAAS and clunky PHP. While Miva Merchant can be used as an online cart, it is much more - especially since it is customizable on two different levels - a fairly simple high-level templating system that allows for reasonable customization, and a lower level compiled language (Miva Script) that allows for extremely powerful customization. Of course, you get what you pay for. If you expect champagne at beer prices, look elsewhere (and please let me know when you find it). PCI compliance and overall security. Miva puts significant effort into the security of their platform. Room for growth. A business can start out using only base capabilities, and fairly easily add more as their business needs grow. Training and documentation. Miva Merchant is fairly complex, and while they continue to make good progress in providing resources for all levels of expertise (beginner to expert), there are still a number of gaps. To take the step beyond the initial levels of online storefront requires expert assistance for most businesses (unless they have some substantial IT/technical resources available). Market for add-on and add-in products. (Note: this is significantly biased by our own business experience selling workflow and feature products for Miva Merchant.) The long-term goal for Miva has been stated to essentially involve having integration partners (selling their time) and larger companion product partners (selling products that work with, but usually NOT within Merchant). There is clearly a gap of potential customer needs that they are attempting to build into the core platform. Of course, no one can cover all needs! While Miva Merchant is not hostile to third-party product companies, neither do they have an explicit place in their long term roadmap. It is my opinion that their strategy of minimizing third-party add-on developers may be throwing the baby out with the bathwater, and I shudder to imagine a time when all significant features only come from the developers within Miva. As good as they are (quite good) they suffer from the inevitable myopia that ALL companies have - they are NOT their customers! In general, unless someone has a tiny business, or expects minimal growth (and why are they in business? is it a hobby?) - I would recommend Miva Merchant. They are solid out of the box, support has gotten very good after a number of years of improvement, and there is room from growth - so you don't have to switch systems when your business grows faster than expected, or you go through a significant change (such as B2C moving to B2B etc.). Miva Merchant is very scalable. Miva Review: "A bit long in the tooth, but still a solid option." 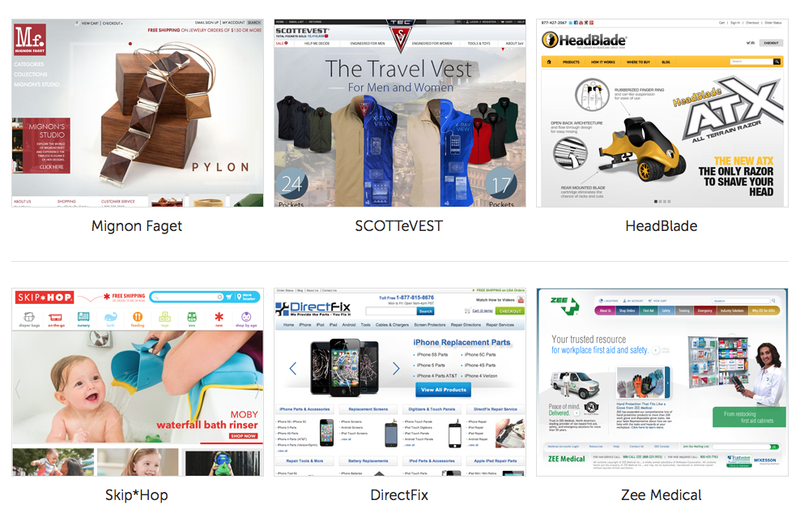 Over the years, I have created several websites for clients using MIVA Merchant. It has been used to create an online storefront. The software is quite powerful and includes many options. I like to use it for clients who need more than just a basic online storefront. The ability to use commercially available modules is a big plus for MIVA Merchant. It has helped me create websites that have more advanced features such as rewards programs, custom shipping settings and checkout fields. MIVA Merchant has been around for a long time and it has a very helpful community. The software is very stable - I've run into very few problems with upgrades. The user interface (UI) of the admin area is quite antiquated. There have been some slight improvements in recent years, but this really looks like an app that has been around since the 1990s. While designing a website to use MIVA Merchant isn't terribly difficult for an experienced designer, it has been surpassed by just about everything else out there. It doesn't have a clean, standards-compliant theme engine like WordPress, etc. 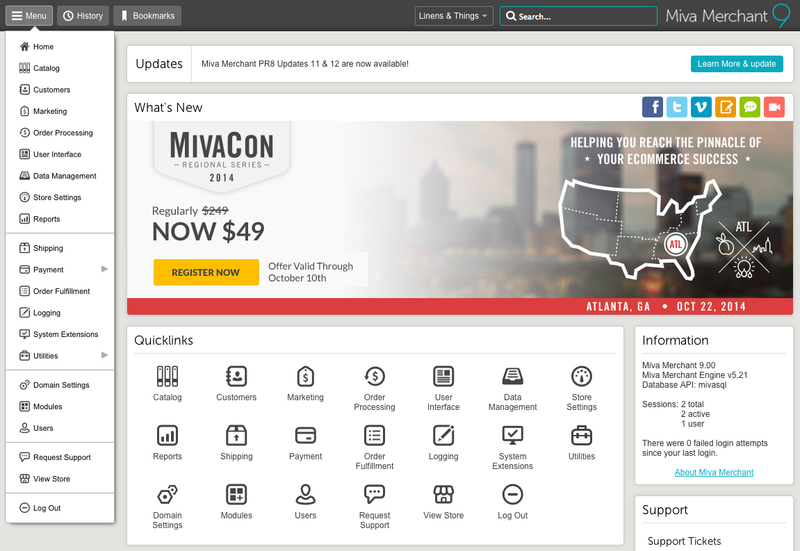 MIVA has moved hosting for their software to their own service, which isn't cheap. And their hosting accounts come with very little disk space (although it is PCI compliant). This is not a content management system (CMS). For anything that a client wants to update, I usually try to pair MIVA Merchant with a WordPress powered main site. Editing page content in MIVA is a very old-school task. It doesn't even come with a WYSIWYG editor, though you can buy one from their module store. Doesn't appear that too many new modules are coming out these days. I think MIVA Merchant is best for large, standalone stores. It allows for more tweaking of code than a lot of ecommerce software that I have used. Even though the interface isn't the gold standard, there still something to be said for the number of options it has and the number of modules available. However, I think it's probably not the best solution if you just need a small, simple store. There are other software packages out there that can do the job a little more efficiently and cheaply. Miva Review: "A Shopping Cart Solution for Online Businesses of Any Size"
I currently offer E-Commerce consulting, marketing, and management services for a broad range of online companies most of which are using Miva Merchant as their shopping cart platform. The online stores I work with are offering anywhere from 20 to 180,000 products online. The shopping cart is primarily used to merchandise products and as a CMS system.Some of the more challenging issues my clients face are work arounds for MAP Pricing (Minimum Advertised Pricing), integrating in-house POS systems with Miva to manage inventory, and integrating live LTL freight rates directly into the shopping cart. All of these feats can be achieve but may require you to think outside of the box. The good thing about Miva is that you are only limited by your imagination as far as what you can do with the platform. Miva Merchant is extremely robust and has very few limitations unlike most other shopping carts. Offers the most bang for your buck! You can run a multimillion dollar online store using their smallest package at $50 per month with ease. No joke! There are many 3rd party modules available for added flexibility. Support staff is great and you can find answers to many questions in their forum (where senior techs tend to hang out). Video tutorials are available too! There is a learning curve and newbies must have patience when setting up a new store out of the box. I was never a big fan of the mobile layout. Fortunately a Responsive design is now available (and rocks)! The ability to tie into 3rd party POS systems more easily would be a nice added feature (but I guess that would require the POS system to be integration friendly as well). Review: "Miva Merchant - A developer's point of view." We use Miva Merchant for ourselves and use it for our clients. The only drawback as a reseller is the cost is prohibitive to host outside of Miva Merchant's own hosting solution. Ease of use. Very easy to set up and use. Expandability. With the use of various Modules already available it is easy to expand Miva Merchant. If there is not Module available, there are third parties who can make one for you for your custom application. Miva Merchant will work for 95% of the target audience without the need of additional Modules. Miva Merchant should have built in Soft Goods Downloads. Miva Merchant should have a built in way to make a Subscription Site to serve videos and protected content. Miva Merchant should have a built in way to output to a PDF to support catalogs and flyers from Miva Merchant. There is only one Module I know that allows you to sell Soft Goods or Down Loads with Miva Merchant. This is a big weakness. You cannot make and easy Subscription Site with Miva Merchant. You pretty much have to host with Miva Merchant it you are a reseller for Miva Merchant. They have made the licensing cost prohibitive to be a reseller for Miva Merchant. Review: "Miva Merchant makes sense for our business"
Many of our customers use Miva Merchant. We develop software that integrates with the shopping cart, and we also implement websites who use Miva, either for the entire site or in conjunction with other packages. Miva provides a great balance between ease of use and ability to customize. Ability to design the entire page from opening to close. We can implement any desired design into the package. A robust API that allows us to program additional features to work with the shopping cart. Excellent hosting capabilities, but without a requirement that users MUST host with them. A strong community of users who offer support and advice, as well as active participation in the forums by Miva's own employees. Currently there is no coupon capability out of the box. I'm excited to see this new feature that's expected to be in the upcoming release. I think Miva is a perfect solution for many businesses. I would hesitate to recommend it to a small business who wants to maintain it themselves without the assistance of either an internal or third-party web developer. For example, some one-person businesses need a very turnkey solution and are willing to sacrifice certain features in favor of a more plug-and-play shopping cart. Miva does have a bit of a learning curve, and some technical expertise is useful. Aside from that, I think it works for most businesses. It is PCI/PA-DSS compliant. Once you've learned SMT and/or MivaScript, it's easy to customize either the look and feel, or the functionality. And it's robust enough for enterprise applications. User Review: "Miva Merchant - Superb." 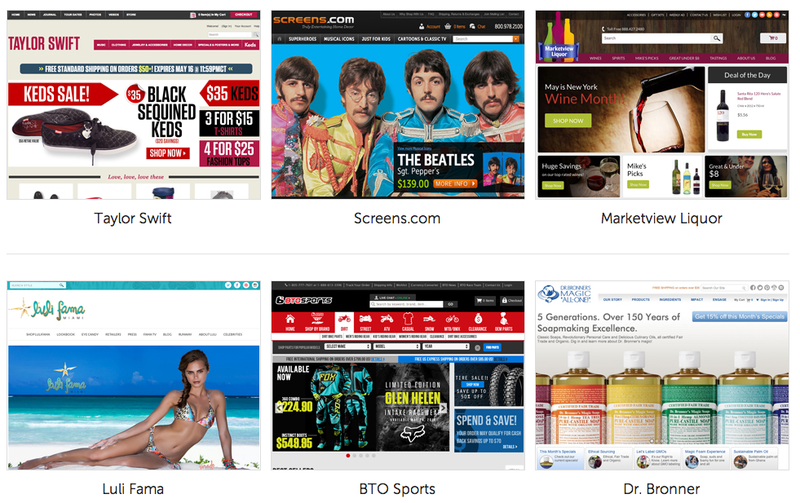 We use Miva Merchant on all of our sites (4-5 at any time). Miva Merchant is highly configurable and easy to use. There has never been an issue we could not overcome - from security to SEO. Additionally, we have put it to the load test - having been featured on the Dr. Oz show twice, it handled all traffic with no issues whatsoever. We also installed it on a cloud setup with multiple load balancers and virtual servers - and no hiccup whatsoever. Easy to use by the customer. Easy to configure for any situation with numerous modules and built in functionality. And - its always your data. Honestly, I am aware of no areas that need improvement at this time. The crew at Miva are always working to bring enhancements. If you only have a few items - maybe less than 10-15, use something simpler. But if you're going to list more, this is the platform you want. Miva: "Gave us the e-commerce site that we so desperately needed"
Prior to using Miva Merchant, the organization was lacking an ecommerce website. Miva aided with wireframe design, strategy, implementation, launch and support. Customized the platform to suit our needs. The cost to develop was great for a medium size business. Review: "eCommerce and Hosting with Miva Merchant"
Miva 5.5 (the current version) comes with a number of standard templates, or you can create your own. Because Miva has been so widely used for so long (it was one of the very first eCommerce platforms) there is a large community of developers who can create custom templates to give your store a unique look and feel. Review: "Merchant’s Perspective – Used Miva For Many Years, But Had To Move On"
Established retail company launched an online store with Miva Merchant over 5 years ago. Early on it was a very suitable platform and met our needs well, particularly its somewhat unique versatility. However, things have been in steady decline for some time. Their hosting was incredibly unreliable and lacked critical management features for no good reason. What you get initially with Miva is really only the shell of a proper online store. Things have gradually gotten better in regard to the features included, but companies who've been on the platform for years and paid for third-party modules and specialized development work receive no benefit. They're consistently about three years behind the pack compared to other major eCommerce platforms and have recently resorted to questionable tactics to increase the revenue they derive from people who use their system. I do feel some online merchants with highly specialized needs could find the customization options offered by Miva compelling, but the start up and ongoing costs for a real storefront are quite severe and lack many useful features compared to other more popular store systems. Prospective and established merchants considering the Miva platform should be warned that they've recently implemented an onerous new fee when more than one person accesses the store admin area at any given time. Specifically, Miva merchants will now be on the hook for $50 per additional simultaneous user per month. If we had remained on Miva, this would have increased our annual costs of using the platform by at least $3,000, perhaps more. The president of Miva claims this is standard for SaaS e-commerce platforms, but I know of none that do and this change makes their platform incredibly unattractive for merchants who expect their business to grow in the future. Furthermore, certain third-party services can be detected by the Miva HQ tracking system as admin users, also triggering an additional seat fee. Exorbitant pricing for adding some basic features that feels like a petty cash grab. For instance, we opted for the $1,000 mobile optimization package and received a bare bones mobile-friendly site with no appearance refinements aside from crudely plopping our logo at the top. They forgot to optimize a few key pages, like the product search results, and it seemed like whoever did it rushed through the work in an hour or two. Other projects they helped with went better, but there's frequently minor coding errors we've had to clean up ourselves. Features released with updates practically always require developer assistance to test and properly enable. Issues that should be treated as bugs are instead left for third-party modules to correct. For example, if a wholesale customer adds items to their cart before logging in, those items retain the standard retail price when the order is placed. We informed Miva tech support of this, expecting that they might look into fixing the problem, but were instead told that we should buy an add-on module that forces a cart recalculation at checkout. Why should this be the responsibility of an extra module to correct? It should be noted that a year or two ago Miva purchased the Emporium Plus plugin catalog, including the cart recalculation module, yet that is still omitted from the core platform. I am aware of some interesting applications of the Miva platform where it may be the optimal choice, but for the vast majority of store owners the negatives greatly outweigh the positives, and, despite some skilled and personable staff, management seems unwilling to make changes that might set the platform, and their official hosting arm, on a better course. Unfortunately, given the fevered competition among eCommerce platforms, I don't really see how they might turn things around unless there's major changes made at the top of Miva and their basic approach to maintaining their system. We used Miva Merchant to build e-commerce websites for clients. We worked with small businesses and individuals on their e-commerce needs. The manager of our company had decided that Miva Merchant would be the best, most secure, e-commerce site to use. It has a user friendly experience when purchasing and checking out. It was easy to teach the client how to upload products to their site. It had many options for payment gateways. Miva Merchant has it's own language which had a high learning curve for me to understand. Customizing the template to match a html/css static site was difficult because you needed those Miva Merchant code pieces to be in the correct places. It used to let people store user's credit card information and process the payment later, which, when hacked, is really bad. It's really important for the Miva Merchant site, once built, to be able to be passed onto the client to be able to manager on their own. Is it easy for a client to be able to go in and be able to edit their own e-commerce? User Review: "Why We Pick Miva Merchant"
We don’t actually use MIVA Merchant at our organization but recommend it to our clients. Miva Merchant is a good choice because of its flexibility, cost effectiveness and its other features. Manufacturing Solutions Center is a service provider for the small to medium manufacturers. We work to help solve problems and test products. Ecommerce is one of the services we provide. Price Groups. This feature is beneficial to the developer and their customers because it allows creation of as many groups as needed. Developer can change the price of products based on membership in a group. They can also assign price change to all or certain products in a group. Registered customers benefit from membership discounts, which encourages customer loyalty. Availability Groups. This feature is excellent because it allows developer to control what categories and products customers see in the store based on membership in a group and only visible to customers who registered and are a member of that group. Manage Orders. End users like the Manage Orders features. Orders have various filters available such as Order Number, Date Range, Order Status, Batches and Batch Report. The most useful feature is the Batches which is a collection of orders, grouped together and given a name with just 1-click. Coupon capability. If end users want to offer coupon discount, they will have to purchase through a third-party. It will be an excellent feature to have. Product layout. The product layout from previous Miva Merchant is much better. Merchant 5.5, the product “Code, Price and Quantity in Basket” is at the bottom of the product instead of with “Colors”, “Size”, and “Quantity” on the right hand side. Custom image sizing does not display well. More Custom Fields/Dropdown options. Our end user has to purchase Addendum from a third-party to use the custom field. Some of our customers are having problem viewing our store after we upgraded to Miva Merchant 5.5. Our products page is empty. Miva Merchant is a point-and-click online store development and management system that allows merchants to build their online store through a web browser, and lets developers provide aftermarket enhancements for the online store. Miva offers a CSS template-based system to customize the look and theme of a site and manage the WCMS elements of the site. This solution includes merchandising tools and tools that are designed to optimize the shopping and checkout experience. Additionally, the system comes with rule-based taxes, shipping calculations and live tax estimating tools.